I listened to nothing but Christmas music to cure my election blues. I forced myself to listen to nothing but Christmas music to cure my election blues. It worked. Does this mean that I am part elf? Photo illustration by Natalie Matthews-Ramo. Photo by Thinkstock. I’ve had trouble getting into the holiday spirit this year, and not just because the world is on fire. I’ve been busy this month, and stressed about money and deadlines and other things. I am no longer a child, prone to giddiness over snow, seasonal décor, and the prospect of presents from a corpulent home invader. While I would dearly love to love Christmas like I used to—this year more than most, I could really use something to look forward to—I’ve been unable to manufacture appropriate levels of cheer. Lucky for me, holiday scientists long ago invented the perfect tool for the forcible injection of seasonal spirit: the Christmas carol. There’s nothing like a rousing rendition of “O Holy Night” or all 832 verses of “The Twelve Days of Christmas” to get the eggnog pumping in your veins. It’s true that most Christmas music is overproduced and lyrically insipid. But most of everything is bad, and even the worst Christmas songs are still evocative. Carols are good music for thinking, if what you want to think about are trees and bells and why more people don’t name their kids “Burl.” They are pure escapism, offering passage into a tinsel-strewn world where it is truly better to give than receive. When I was younger, I would tape holiday songs off the radio, presumably so that I could listen to them throughout the year, which I never actually did. As a teenager, I would dress up and sing madrigals in public, as one does. My present Christmas habits are decidedly more Scrooge-like: I sit around counting my money, get depressed that I don’t have very much of it, and then force myself to sit and work while others play. So I decided to jolt my cheer-acquisition process by revisiting the methods that worked for me in my youth: mainlining Christmas songs until I get jolly or go nuts. Last week, I began listening to Christmas music nonstop, at all hours of the day and night. At home, I had Christmas music playing continuously at an audible volume. When I went out into the world, I wore at least one earphone connected to a carol-delivery device. I fell asleep to Christmas music, woke to Christmas music, showered, worked, ate, and evacuated to Christmas music. For a little less than a full week, I gave myself no escape from the sound of jingling, let alone ring-ting-tingling. It was a holly-jolly blitzkrieg. But here’s the surprising thing: I loved it. (To be clear, my friends and family did not.) While logistically challenging at times, this experiment was mostly delightful. I made it through five full days of constant aural jollity, and could have made it through five more. Does this mean that I am part elf? Who knows. All I know is that it worked. I have never been more pumped for the holidays. Still, it took awhile to warm up to the task. I began by relying on preprogrammed Christmas music stations and playlists on Spotify. There are a lot of these, and most of them are suspect—the tagline of “Rock Christmas” is “Holiday Music You’ll Actually Want to Hear,” which is probably true if you are a Hot Topic shopper from the year 2002. My tastes ran more to the “Christmas Classics” playlist—your Bings, your Burls, your Thurls—but even this compilation could only muster a 2-to-1 ratio of joy to tedium. Soon enough, even the good songs became tedious, and I began to resent Bing Crosby and his somnolent phrasing. Things got worse when I tried to fall asleep. I have trouble sleeping anyway, and having my mindspace hijacked by “The Happiest Christmas Tree” did not help matters. Even when that song ended, its idiotic refrain—“I’m the happiest Christmas tree, ho ho ho, hee hee hee”—kept playing in my mind. It took two stiff drinks to kill that particular earworm, and I subsequently vowed to limit my bedtime carol intake to classical melodies. After that, I had no problem falling asleep to an extensive Baroque Christmas playlist. 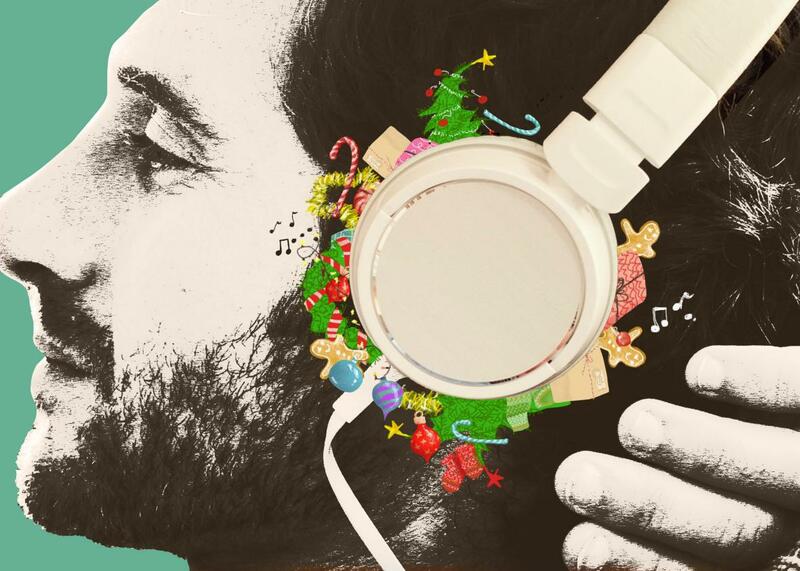 I had learned my first lesson in obsessive holiday listening: You have to be your own DJ. The next day I woke up intent on compiling the ultimate holiday playlist—one that worked both as a seasonal cheer and as music. Naturally, I kicked it off with Mel Tormé, the great jazz vocalist, who co-wrote “The Christmas Song” and recorded what I consider to be the definitive version. Any “Christmas Classics” playlist that omits the Velvet Fog is a joke. I added other standards-singers whose work I love: Joe Williams, Billy Eckstine, Oscar Brown Jr. After taking care of the classics, I started to branch out. Pretty much every musician you can name has recorded at least one Christmas song, which makes it easy to curate playlists that work both as carols and as music. The trick is to identify the musical genres you love and search within them. My tastes are eclectic, but generally run toward power-pop, roots music, soul, jazz, and Tom Petty. Soon enough, the playlist was bursting with exemplars from all of these genres. From there, I just started typing artists’ names (plus “Christmas” or “holiday”) into Spotify to see if anything would come up. This is how I learned that the band Tommy Tutone cut a lame Christmas-themed version of its hit “867-5309/Jenny,” with “Santa Claus is coming to tow-eee-own” replacing the standard chorus. Naturally, it made it onto the playlist. Walking around presented another set of challenges. As it turns out, people will think you are rude, or at least very strange, if you insist on keeping your earphones in when interacting with them. An otherwise benign holiday lunch became super awkward when my dining companion and the server both realized that I had no interest in removing my earphones during the meal. I compromised by keeping one earbud in and letting the other dangle, but if anything this was more noticeable, and it just created a weird aural friction to have the Messiah playing in one ear and the Cars playing over the restaurant stereo in the other. I soon became familiar with this sense of sonic dissonance. On Saturday night I went to a concert and I spent the entire night listening to the band with one ear and listening to “First Christmas” with the other ear; my only respite was when the band played a holiday song of its own, which meant I could free myself briefly from my earbuds, and from Stan Rogers’ insistence on making me feel all the horrors of a nursing-home Christmas. This dissonance became stressful. I did not need more stress in my life. So I tried not to leave the house if I could help it. As it turned out, this sequestration was just what the Christmas doctor ordered. I spent a couple of days just lying on my couch, listening to holiday music, tinkering with my playlist. Was it distracting to have holly-jolly tunes playing at all hours? Yes, of course, but that is not a problem if you want to be distracted, which I did. Donald Trump may be fighting his own battle to weaponize “Merry Christmas,” but I want no part of it. As I was working and reclining, I felt myself de-stressing, and starting to appreciate the season. It’s easy to become cynical about our annual onslaught of Christmas kitsch, to resent the way seasonal sentimentality is used as a sales tactic. But I’ve learned to once again appreciate this unrelenting emphasis on doing nice things for the ones you love, on themes of unity, charity, and redemption. I spend all year thinking mostly about myself. The Christmas culture encourages me to spend at least one day of the year thinking about others. We right-thinking, consumerism-skeptical folks tend to reflexively dislike the trappings of the season. Maybe we shouldn’t. Anyway, I formally ended the experiment when I had to go to the airport to fly back to my hometown for the holidays. Two hours at LaGuardia sent my stress levels rising again. But, for a brief period until that point, I was truly in the holiday zone. You could be, too. If you find yourself lacking the appropriate seasonal spirit, I recommend listening to as much Christmas music as possible, and also not leaving your house.